ChristianCafe.com:A different dating site which is a stylish place to meet single Christians from around the world. Its members hail from the USA, Canada, the UK, Australia and a variety of other countries. ChristianCafe.com has been successfully connecting Christian singles since 1999. In that time, the service has matched tens of thousands of single Christians in Christ-centered marriage. Christian Cafe is also Christian owned and operated, a fact that sets it apart from the other major players in the Christian dating niche. This dating site is a comfortable relaxing online Cafe where Christian singles connect with one other. 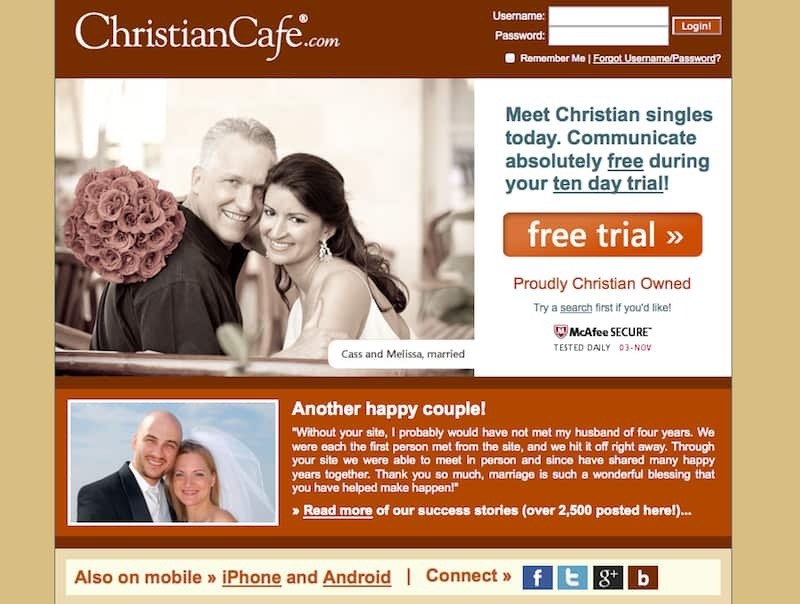 Whether you’re looking for a companion, a date, or a soul mate, ChristianCafe.com is the place for you. There are over 100,000 registered members at the Christian Cafe Dating Site, and this is a very reliable number. The service was created for Christians, by Christians, and it has produced thousands of successful matches. This unique matchmaking service is a perfect solution if you’re simply looking for friends, want to casually date or if you’re serious about meeting marriage material. You can customize the Christian Cafe experience to your own preferences and feel assured that you’re communicating with like-minded Christians. The site creates a comfortable experience for all its members, so you can feel free to share your life stories and engage in prayer with your new friends. Signing up is simple. You can choose to answer a host of questions about your life, preferences and religious views, or you can leave that all for later. After your registration is complete, a personalized profile is created; your profile will show an uploaded picture, physical descriptions, location, personality details and short answers. By paying attention to the finer details, Christian Cafe is better equipped to match you with prospective mates. When registering an account with Christian Cafe, you’ll start with a free 10-day trial. Fortunately, a credit card is not required upon registration, so you’re not in danger of being charged when the trial has exceeded its limit. During your free trial, you’ll have access to most of the main features on the site. With the free edition, you may use your Christian Cafe email, view and search profiles of fellow Christians, instant message people, participate in forums and read the site’s articles. As an added bonus, when you recommend a friend, you’ll receive five free days for every person who joins Christian Cafe. You can also chat to members by sending private emails or getting involved in the chat rooms. There’s also a prayer message board for you to leave your thoughts and wishes, sharing your hopes with others. This was a nice touch, and it allows people to spread a little love and compassion, which is no bad thing. If you combine all of these elements you could even find a relationship based on the prayers you make, which might get you noticed. When your free trial period is over, you may continue the service by purchasing a membership plan. Currently, Christian Cafe has four membership plans available, and you can pay for just one month or commit to a longer service plan. Their coffee plan, which totals to $34.97 a month, allows for a month of service with no commitment to additional months thereafter. The cafe latte membership, which totals for $42.97, can be paid in installments of $14.99 a month. For a complete price of $57.97, the mocha java service lasts for 6 months, and you can pay a $11.32 monthly installment cost. The coffee collection membership plan, which is an entire year of service, will cost you $8.16 a month or $87.97 up front.